Stuff I Learned or Laughed at from Bloggers in the 2013 A to Z Challenge . All you gots to do is identify the Mystery Blogger each day. I’ll give you hints when I can. I’ll post the answers and the winner each Monday. Okay we’re down to the last two weeks, well week+. 1) identifying the most bloggers correctly=2 points. TIES WILL BE BROKEN BY MY CAT. SHE’S FAIR AND IMPARTIAL.UNLESS CATNIP IS INVOLVED, THEN SHE GOES WITH THE BEST SUPPLIER. Mystery Blogger S’s 2013 theme: All about science. fWho is it? HINT: This blogger is soars high as an eagle. I miss Golden Eagle too. And I thought that manslaughter case was so bizarre! I saw everyone's comments and visited Golden Eagle's site. I wish she were actively blogging now. I haven't a clue, as usual. 🙂 Earthquakes are scary though. That might be Golden Eagle, but I'm not sure what his real name is. Or maybe his name really IS Golden Eagle. With the plethora of names like Blue Ivy, Apple, Bronx Mowgli, Diezel Ky, and Kal-El (kid you not, Nicholas Cage named his son Kal-El from Superman fame). Golden Eagle sounds pretty cool. Sounds like she's not blogging much. Hope to connect with her in the future. You give good hints, but I don't know! Can't beat the ninja master! Wow! These folks are on!!!! One time, The Golden Eagle asked a question in one of her posts. "What's your favourite (favorite) Eagle?" To which I replied, "Don Henley." This post made the earth move. Your map is cracking up, Lee… 😉 I had no idea a version of the seismograph had been around for that long! Thanks for visiting the UR blog today! I'd never heard of this particular blogger, but she sounds fascinating. I have to think it's The Eagle's Aerial Perspective though I haven't been to her blog for a while. What a great theme for A to Z, Lee! How fun. The blogger for The Eagle's Aerial Perspective. The hint really hit home. Well I cheated…but I didn't know Golden Eagle, so I *had* to cheat lol That was really cool to learn though, Seismology, I've never heard the term before. I don't know Golden Eagle, but it's too bad she's not blogging at the moment. That's interesting that the seismograph was created in China so long ago. Even I know Golden Eagle! Hopefully she will fly back to her nest and start posting regularly again. The Golden Eagle – I miss her posts. She has a great heart for fiction, science, and beauty. I was doing so well for a while and now you've stumped me every day lately. I had no clue on this one. No clue x 2. If I hit the science one I probably wouldn't have read it as it's not a topic I tend to understand or enjoy. But, I thought of Arlee…the bird connection anyway, lol. Didn't know the blogger, but looks like it's been figured out already, anyways! 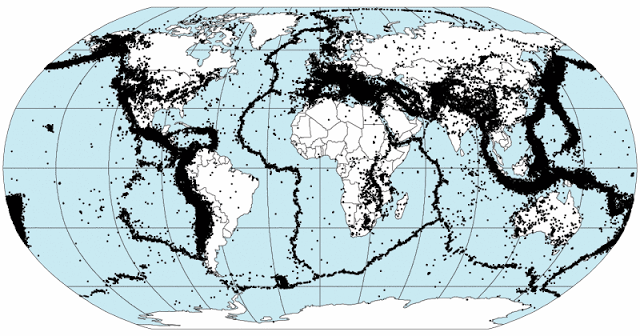 I did know about seismology, although I had no idea it unofficially dates back so far. I can see that it's tough for me to get here before the folks on the East Coast, but I was close! I knew who the blogger was but couldn't think of the exact name of the blog. Alex and Nick reminded me. She did a lot of science posts. That would be the lovely Golden Eagle. Is she away from the blog at the moment? Golden Eagle! I miss her.